"Transactional Analysis Psychotherapy | an integrative approach"
"Ros Sharples offers an integrative and relational approach to Transactional Analysis Psychotherapy in Pembrokeshire, West Wales"
Transactional Analysis PSYCHOTHERAPY MAKES SENSE OF HOW people EXPERIENCE THEIR relationship to others, THEIR ENVIRONMENT ​and themselves, clarifying how this may stem from past experiences. 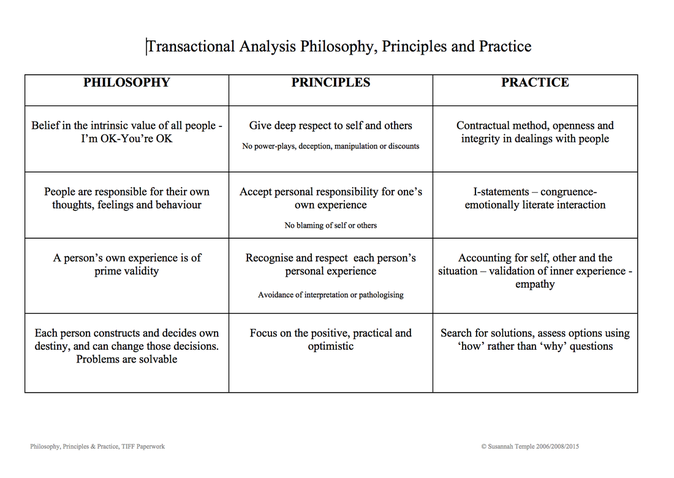 Transactional Analysis is a psychotherapeutic approach developed by Eric Berne. It is a wonderful technique for understanding how human beings work and why they relate to each other in certain ways. It is a process that looks at how the past may still be impacting the present. We will look at what you learned from your early relationships and clarify how you use this in the present in relationships to others. We also look at how how unconscious negative beliefs about yourself developed in childhood are played out in your life in general. By separating out what works from what doesn't work, what belongs to the past and what belongs to the present it is possible for you to change your future. I share effective therapeutic tools with the client to clarify thoughts, empower the self, explore feelings, support change and create a space for healing to occur. "What's going Wrong in my Life?" .......And sometimes you feel really overwhelmed and young. .......And at times that little part of you probably still feels overwhelmed. As children we have to learn behaviours in order to cope with things that we may only partly understand. These ways of behaving helped us get by, but may be less useful now. In practicing Transactional Analysis I believe it is important to 'get to know' that part of your self and give all those confusing feelings some time to express themselves in a safe and contained environment. I believe that all of who you are is important. Part of therapy is developing a new internalised adult voice that is more nurturing and thoughtful about your wellbeing. In therapy we investigate these patterns of behaviour and experiences; find ways to make the desired changes and to step out of the loops.